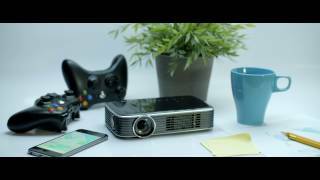 The Vivitek Qumi Q8 is the world's smallest 1080p Full HD LED portable projector! The Vivitek Qumi Q8 is a stunning all-round projector that gives crisp, clear Full HD images up to 120 inches in size, right from the palm of your hand! The Q8 possesses a 1000 ANSI Lumen LED punch (6000 marketing lumens), making it bright enough to clearly project in any light. It also has a whole host of amazing connectivity features that give you a truly wireless projector, including Wi-Fi and a PC-free reader that allows you to preload files onto the projector in order to play almost anything, anywhere, anytime. The Q8's incredible brightness and ease of use make it a perfect choice for business or pleasure - it has enough power to cope with any environment but its simple interface and Android and iOS wireless connectivity, as well as intelligent automatic features such as a sensitive auto keystoning feature mean any tech novices will soon be projecting like a pro! This Product also comes with 3 Year Manufacturer's warranty! The world's smallest 1080p full HD LED pocket projector, the Vivitek Qumi Q8 is a stunning all-round projector that gives crisp, clear HD images up to 120 inches in size, right from the palm of your hand! It's the first portable projector that yields a professional full HD 1920 x 1080 resolution inside a projector that fits in the palm of your hand and weighs just 621 grams. At only 19 x 11.4 x 4.3 cm (W x D x H) in size the Qumi Q8 is a feat to behold considering the awesome power, brightness and resolution the projector offers. The Q8's incredible brightness and ease of use make it a perfect choice for business or pleasure. It has enough power to cope with any environment but its simple interface with Android and iOS wireless connectivity, as well as intelligent automatic features such as a sensitive auto keystoning feature mean any tech novices will soon be projecting like a pro!